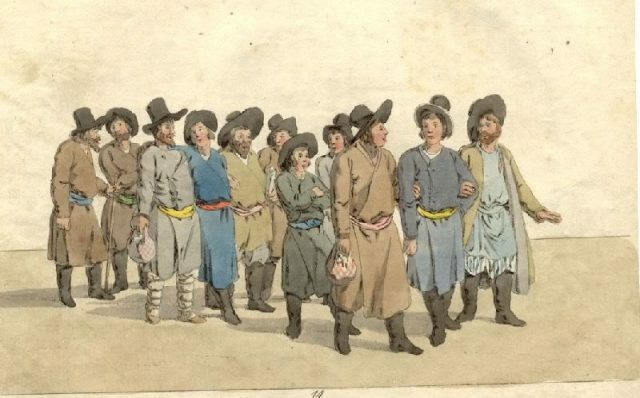 Weddings, at least in the western tradition, are often quite similar. There’s the engagement period (sometimes short, sometimes years), the bachelor party, the giving away of the bride, the cake, and the honeymoon. But have you ever stopped to think about where these traditions originated and why they are still practiced today? 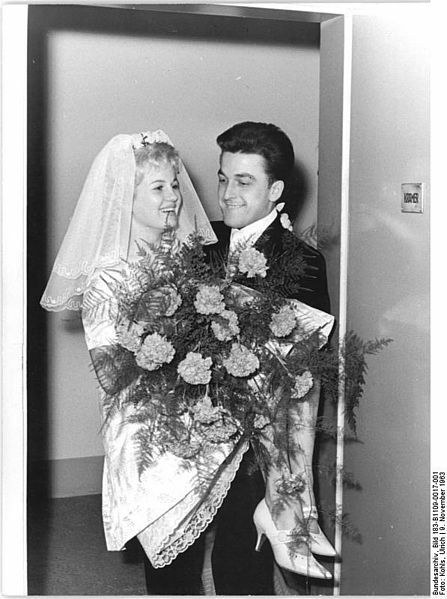 Here are just a few of the more common wedding traditions, and their roots. Today, men often have a bachelor or stag party (or for women, a hen night or bachelorette party) as a last “hurrah” before tying the knot with their beloved. The first reference to a “bachelor party” comes from the 19th century and can be found in the Oxford English Dictionary, but parties celebrating the groom’s last night as a single man date from as far back as the 5th century BC in ancient Sparta. The groom on the way to the bath on the eve of the wedding (a group of men holding each other’s hands). Interestingly, the term “bachelor” originally meant a young knight-in-training, like a squire, and was mentioned in Geoffrey Chaucer’s 14th century work The Canterbury Tales when he referred to an unmarried man. The tradition of a bride wearing white for her wedding originated in Great Britain and was popularized by Queen Victoria. 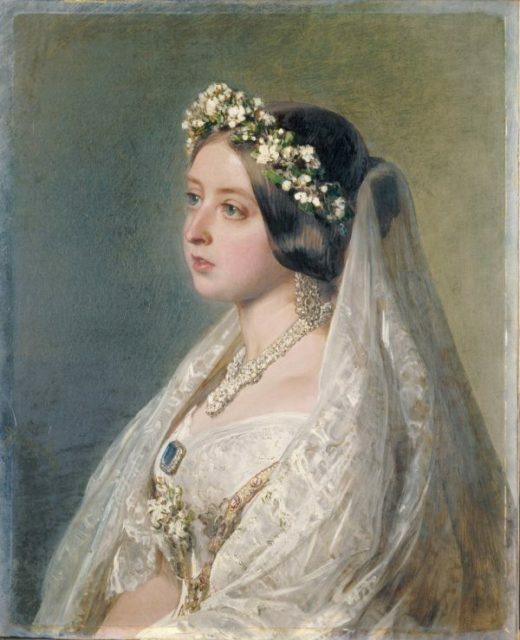 In 1840, when she married Prince Albert, Victoria wore a white lace court dress. Bucking the customary trend of royal brides wearing heavily brocaded and elaborate gowns, the Queen set a new fashion and news of her dress spread throughout the Empire and across North America. Other members of the elite soon followed in her footsteps. The tradition was not fully embraced by the middle-classes in Great Britain until after the Second World War, however. e “old” was to ward off evil and provide a sense of continuity as the bride begins her new life. This is often an heirloom of some variety, like a piece of jewelry from a family member. The “new” represents optimism for the future, and is usually the bride’s dress itself. Something “borrowed” was said to bring the couple good luck, and can often have sentimental value. 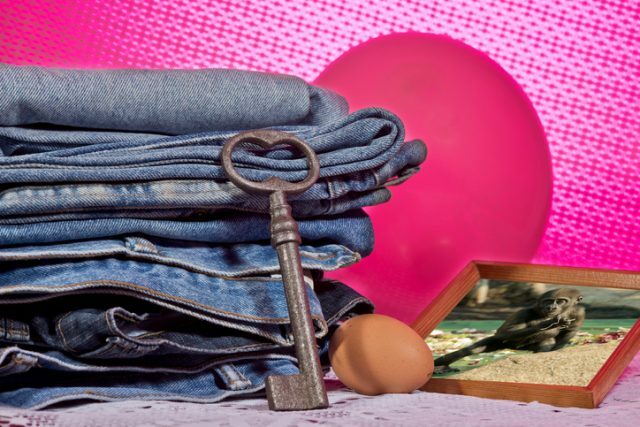 And the “blue” item was said to represent purity, love and fidelity. It is unknown from where the rhyme originated, but it dates from at least 1876, where it is referred to as “an ancient custom” in the book Bye-gones, Relating to Wales and the Border Counties. 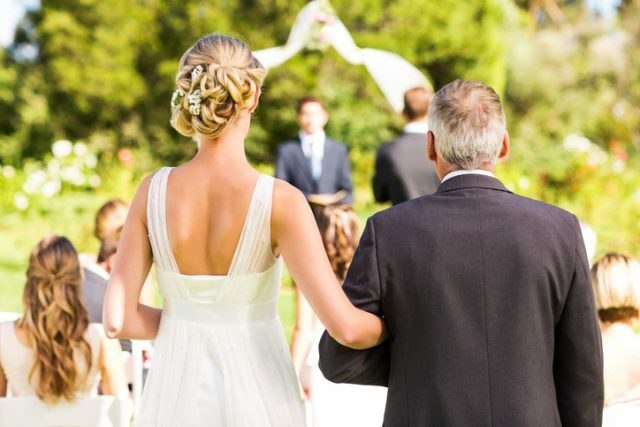 In many (if not most) weddings, a male family member walks the bride down the aisle to “give her away,” It is not always her father, as was the case with the Duchess of Sussex’s recent wedding, when her future father-in-law walked her down the aisle. Rear view of bride and father walking down the aisle with people in background during outdoor wedding. Horizontal shot. The tradition is often seen as the family member accompanying the bride on her way to her new life, and has been a part of weddings around the world for centuries. However, female children used to be the property of their fathers. By literally handing over his daughter, a father was transferring ownership and responsibility of her to her husband. Thankfully, however, the act is only a symbolic one in most weddings today. Wedding cakes can be extremely elaborate, beautiful and very expensive. 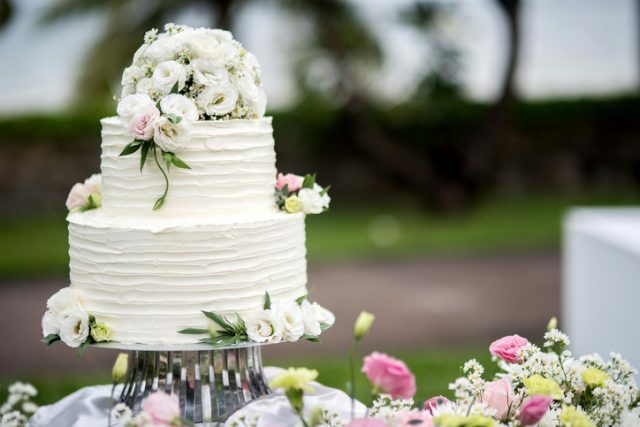 Traditionally, they take the form of tiers, embellished with everything from flowers to edible “pearls.” Wedding cakes are nothing new, however, and began as early as ancient Rome, when a simple cake would be broken over the bride’s head to bring good luck. Beautiful wedding cake, close up of cake and blur background, selective focus. During the Middle Ages, cakes were stacked as high as possible as a sort of dare for the bride and groom. If they could kiss over top of it, they would have a good marriage. From the 17th to 19th centuries a “bride’s pie” was often served, and would sometimes have a glass ring in it. Whoever found the ring would be the next to be married. Wedding cakes have evolved to indicate social status and wealth. The bigger and more extravagant the cake, the higher one’s social standing. The wedding is over and the happy couple embark on their honeymoon to a tropical island paradise to bask in their newly wedded bliss. The term for this post-ceremonial vacation actually comes from the Old English “hony moone” and is quite literal. The “honey” part refers to the sweet, idyllic time that (hopefully) accompanies couples in their first weeks of marriage, roughly the span of one moon cycle, or four weeks. In 1542, Samuel Johnson described the honeymoon as, “the first month after marriage, when there is nothing but tenderness and pleasure.” Curiously, a 2015 study found that going on a honeymoon resulted in a lower risk of divorce. 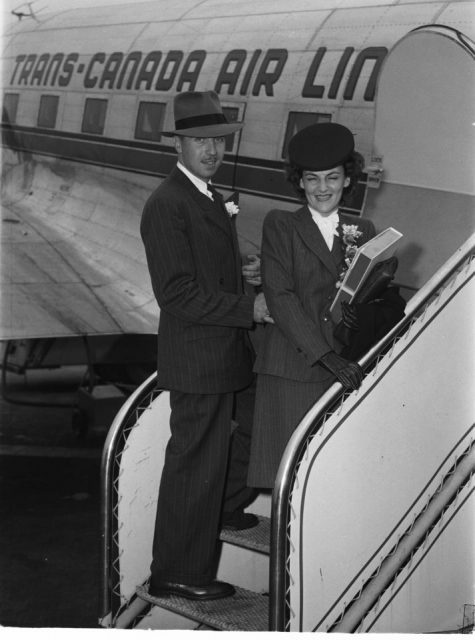 The tradition of a groom carrying his bride over the threshold, or through the doorway, of their home (or hotel room) has different meanings in different cultures. In ancient Rome, it was believed that a bride who tripped over the doorway would bring bad luck to her marriage. Carrying her prevented this from happening (assuming that the groom did not trip either). Other darker origins may be that the bride was not particularly willing to be married, and had to be physically carried in to the groom’s home against her will. In Zoroastrianism, a groom cannot touch the doorjamb as he walks through it, after which his mother-in-law marks his forehead with a red pigment and then throws rice at him. 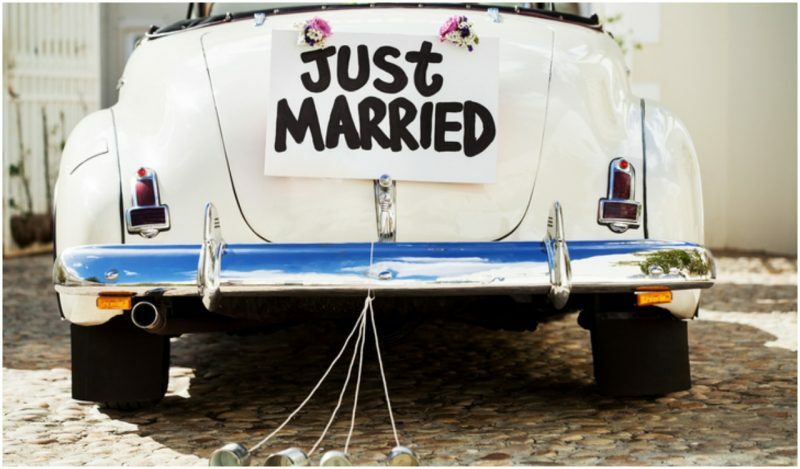 Brides and grooms may not understand all of the origins of the rituals and traditions on their big day, but if they help to start the couple off on a happy marriage, then the more traditions, the better!